EEG 3 - Everyone's Environment Grant Round 3 - Qld. Govt. Terrain - Terrain Natural Resource Management - Aust. Govt. Bio Fund - Biodiversity Fund - Aust. Govt. This season's plantings are at sites where previous community plantings have been held, except for the planting at Frazer Road. This road is at the bottom of Rangeview and is easily accessed from the Kennedy Highway opposite the Rocky Creek Memorial Park. For all plantings, look for the TREAT signs. Cutler Road is off Lake Barrine Road; Pressley Road is off the Gillies Highway; Rock Road is at the junction of McKell Road and Kenny Road; Kenny Road is off the Malanda - Millaa Millaa Road; Massey Creek is on the Old Palmerston Highway. All plantings are on new areas except the Emms planting which is an infill planting. The Bonadio planting will be combined with a field day and on this occasion the barbecue will be supplied by the Bonadio family. Trees are being supplied by QPWS/TREAT for Freeman's, Rock Road and Massey Creek. TRC nursery is supplying trees for McCaffrey's, Rock Road and Frazer Road. NQLMS are supplying trees for Bonadio's. Trees for Emms' are from their own nursery. Several smaller plantings will be done on Friday mornings, but dates are yet to be determined. Two of these will be at Donaghy's Corridor and two at Peterson Creek. Email Doug Burchill at dcburchill@bigpond.com to be on the information list for these plantings. How Useful is Revegetation for Wet Tropics Rainforest Birds? Your sightings of Lumholtz's TKs are important to us! To help Lumholtz's tree-kangaroos in our landscape we need to know their whereabouts. Your sightings of tree-kangaroos are important because they can tell us a bit more about the animals' movements and the areas they use. Wherever you see a tree-kangaroo please let us know the date and location as accurately as possible, and if possible, take a photo of the animal(s) and send it to us. This is a wonderful time of year to examine the Gymnosperms or non-flowering higher plants as many of them are fruiting. 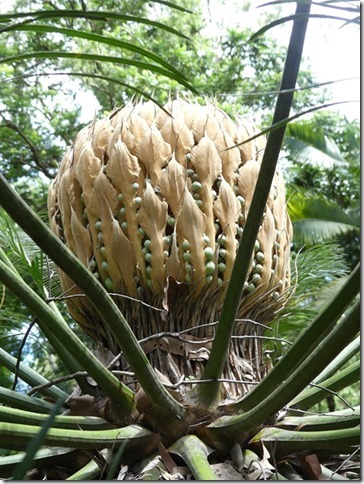 Cycas media which grows on granites around the edges of the Tablelands is just losing the last of its fruit from last year and male cones can be seen developing early in this three month period. Bowenia spectabilis cones are developing now and will ripen throughout with a peak in late March. Their cones are borne close to the ground and are pollinated by small beetles which read the heat signature of the cones in the leaf litter. A Lepidozamia hopei in my garden has a cone developing for the first time. This plant I grew from seed collected about 35 or 36 years ago, and planted in this spot almost 22 years ago. While this individual now has a trunk 800mm high and fronds almost three metres long, others from the same seed batch have no trunks. Although they are slow growing they are not quite as slow as some would make out. Watch for these at the Jindalba boardwalk in the Daintree National Park and at Clump Mountain National Park. 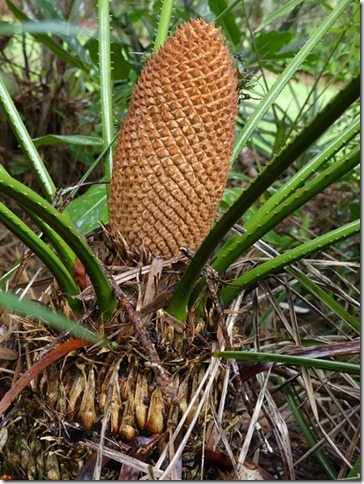 Female Cycad cone, Immature male cone on Cycas media, Female cone on Lepidozamia hopei plant about 35 years from seed, in cultivation, Yungaburra. The family Podocarpaceae is one of the southern conifer groups with its centre of distribution being in the Australasian region. The 160 species are grouped in about 15 genera. 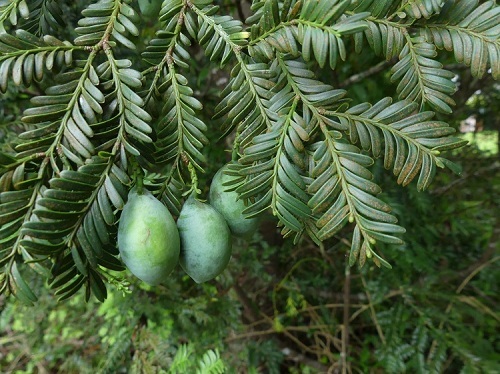 Podocarpus are often referred to as 'plum pines' for the fleshy bases to their seeds. Usually the small male cones are borne terminally with bracts and spore bearing scales arranged spirally. Podocarpus dispermus with its broad leaves and double seeded 'fruit' is ripe now on the wetter parts of the Tablelands below 800 metres. On the Mt Lewis - Mt Spurgeon Tablelands the lovely Prumnopitys ladei is in fruit now. Look out for the red drupe-like fruit of Sundacarpus amara when visiting Mt Hypipamee over this time. It was not just the animals which seemed strange in this country to European explorers and naturalists; 'broad-leafed conifer' is almost a contradiction in terms for them. 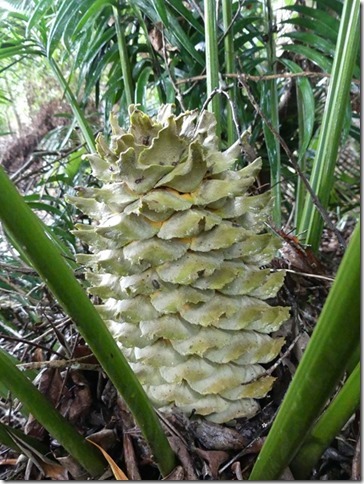 Many of the Araucariaceae (Bunya, Hoop and Kauri Pines) drop their fruit at the beginning of the wet season. The Tar Tree, Semecarpus australiensis, is finishing its fruiting now. This plant also has a swollen receptacle, in this case orange or red, but is a flowering plant in the family Annacardiaceae which includes mango and the cashew which the Tar Tree greatly resembles. While the receptacle is edible in small quantities, great care should be taken with this plant as the sap is poisonous, causing a chemical burn. The fruit itself is also toxic, containing the chemical urushiol. It is best to handle with gloves. The brown fruit of Orange Jacket, Xylopia maccraeae, are splitting now to reveal the orange to scarlet interior and the blue-grey seeds. This tree which grows slowly in gardens and does not seem to reach great size is the host of the Green-spotted Triangle, a beautiful butterfly. Castanospora alphandii, Brown Tamarind, has fruited well this season but most of the fruit may have dropped before you get this newsletter as they are one of the few things which seem to be early this year. Other 'tamarinds' will also be fruiting over this period and some have spectacularly coloured fruit. Look out for the large fruit of Diploglottis bracteata in the Lake Barrine to Boonjie area. Some of the Elaeocarps will both flower and fruit over this three month period. Watch for the flowering of E. grandis near the car parks of each of the Crater Lakes and the small blue-green fruit of some of the smaller seeded Quandongs including Brown Quandong, Elaeocarpus ruminatus, and White Quandong, E. foveolatus, as you walk around those lakes. Also keep your noses ready for the sweet pineapple smell of Phaleria clerodendron, Scented Daphne, coming from its white tubular flowers. Channel-billed Cuckoos have had a very good breeding season this year on the Tablelands. Partially this may be due to more Currawongs remaining at these lower altitudes during the summer because of the food they are offered. This is fine for the predatory Currawongs but there has not been a single successful nest of any Monarch species along Peterson Creek in Yungaburra this season. In February these largest of the cuckoos will form flocks preparatory to migration to PNG. Often they do this to the west of the rainforests and Mareeba saleyards are a great place with its huge fig trees providing fruit. Many of the ducks and geese which breed on ephemeral wetlands have left the Tablelands but our resident ducks will be breeding. The large fruit pigeons nest most reliably at this time of year and given how noisy the smaller ones have been this last fortnight, I expect that they will be too. This is rather late in the season for Superb and Rose-crowned Fruit-Doves to nest. Other late nesters include the Pied and Spectacled Monarchs. This is a great time to spotlight in the rainforest as the number of young animals is high. I have seen more tree-kangaroo breeding behaviours in the early wet than at any other time of year. Now that we have more researchers spending time with these animals in the rainforest it will be interesting to see how they add to our knowledge. Geckoes are out every night in these warm wet conditions and katydids and raspy crickets are laying their eggs in the soil. Luminescent fungi have made an appearance already in the rainforests and as long as we do not get a hot dry spell they will increase in numbers of fruiting bodies. I hope that 2016 brings you many wonderful wildlife experiences. We are lucky to live in such a rich environment; let us nurture it so it remains well beyond our life spans. Happy New Year to you all. It has been great to see some monsoonal activity early in the season and it appears most of the local area had at least some rain and with any luck we'll continue to get follow up rains as well. Many thanks to the School for Field Studies students for spending their October Friday mornings spreading fertiliser over the Peterson Creek plantings and planting a few trees as well. Thanks also to Peter Snodgrass and Alan Gillanders (and helpers) for making the annual tree identification and propagation workshop a success once again. The nursery should be back in full swing by mid-January with TREAT volunteers returning to Friday morning working bees on 8th January. There will be plenty of weeding and pruning to do following the Christmas/New Year break and no shortage of fruits to be processed and seeds to be sown. We have plenty of trees ready to go out to projects and members. The first major community planting kicking off on Saturday January 30 will see 3000 trees added to TREAT's Peterson Creek Corridor project. For more details of this year's scheduled community tree plantings see the front page. Throughout the world, clearing of tropical rainforests has resulted in significant losses of biodiversity and continued environmental degradation. In an effort to reverse these effects, governments, community organisations and private landholders have invested considerable resources in revegetation. TREAT, of course, is an organisation at the forefront of community revegetation efforts on the Atherton Tablelands and some TREAT projects have attracted international attention. For example 'Habitat Linkages in the Southern Atherton Tablelands', which encompasses Lakes, Donaghy's and Peterson Creek habitat linkages or 'corridors', has been internationally recognised as one of Australasia's 'Top 25' ecological restoration projects by the Global Restoration Network. By revegetating, we aim to provide habitat which will be used by forest-dependent fauna. But since efforts to restore rainforest to formerly grazed and open pasture areas are a relatively new activity, this is largely a matter of hope or faith rather than a firm expectation based on evidence. For example, little is really understood about what characteristics of revegetated sites could make them more or less attractive to colonising fauna, or about which kinds of animal species are more or less likely to colonise these sites. To answer these questions requires systematic research and monitoring of fauna in revegetated sites. Birds are useful indicators of a revegetation site's progress over time, because they are diverse in species, habits and diets. Birds are often especially responsive to vegetation change - an important characteristic in monitoring revegetation sites. Birds also play important ecological roles. For example many rainforest plant species depend on fruit-eating birds to move their seeds around the landscape. In this article we review the accumulated knowledge from previous and recent research into the ability of revegetated sites to provide habitat for rainforest birds in the Wet Tropics. Locally, a number of research and monitoring projects in the early years following initial tree planting showed that, as the vegetation was rapidly transformed from grass to tree cover, the bird communities also changed quickly (see references 1, 2, 4, 6, and 7). As the tree canopy cover became established, the former low diversity community of bird species that typically inhabit areas of short grass gave way to a greater diversity of species, including some that typically are found in either eucalypt forest or rainforest. These 'forest generalists' increased in both abundance and variety over time. For example, the Lewin's Honeyeater is a forest generalist which was found in 100% of intact rainforest sites as well as 67% of younger and 100% of older revegetated sites. It feeds on fruit and is an effective disperser of rainforest seeds. It took several years, however, for the revegetated sites to attract even a small proportion of the many specialist bird species that depend on, and hence are largely restricted to, rainforest habitat. And even when the number of different rainforest specialist bird species had built up to about 50% of the mature forest 'target' (for example, by about 10 years after planting), most individual species were less abundant than in mature forest. The style of revegetation also influenced the bird community that became established in a site. For example at around 10 years old, sites planted for timber had attracted even fewer rainforest bird species than those planted at high density and diversity for ecological restoration (see references 1 and 2). These studies raised as many questions as they answered. For example, do bird communities in revegetation sites continue to progressively acquire more rainforest-dependent species in the second decade after planting, eventually leading to an overall mix of species which resembles that seen in remnant areas of mature forest? And if so, how long does it take to acquire a full complement of rainforest species? And can all rainforest bird species benefit from revegetation? The Wet Tropics region has been an international pioneer in the development of techniques for high diversity forest restoration using native tree species. However these efforts only really got going from the 1990s onwards, and the lack of older plantings has limited scientists' capacity to seek answers to these questions. What happens to the birds as revegetated sites get older? Additional progress towards finding answers was made by a Griffith University project which investigated the bird communities of 25 revegetation sites on the Atherton Tablelands (see reference 3). The different sites were selected as a 'chronosequence', representing ages of 1-24 years since first planting, and included several TREAT project sites. Additionally, there was a second chronosequence of 16 revegetated sites of different ages in the lowlands. The research team conducted six repeated bird surveys at each of these sites in 2008. 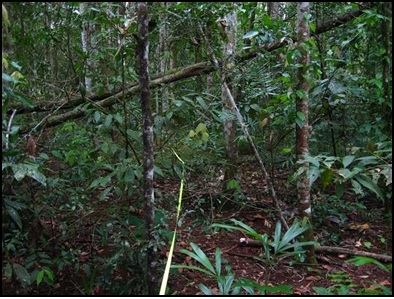 Surveys were also conducted in further sites within both intact mature rainforest and grazed pasture, to provide reference measurements against which to judge how rapidly the bird communities of revegetated sites had progressed towards the target of a 'forest-like bird community'. The graphs in Figure 1 show how the number (richness) of rainforest-dependent bird species increases as replanted rainforest vegetation gets older, while at the same time the richness of grassland/ wetland bird species decreases. 'Rainforest-dependent' bird species are those which in undisturbed landscapes are largely confined to rainforest habitat, being rarely seen in grassland or more open forest types such as eucalypt forests. At about 10 years old, restored sites supported on average about half the number of rainforest-dependent bird species typical of rainforest - a result also seen in the earlier studies. This study also found that the pattern and rate of turnover in bird species over time was remarkably similar between the lowlands and uplands, despite the fact that many of the actual bird species involved are different. Figure 1. The relationship between revegetation age (years) and the number of species of Rainforest (RF) and Grassland/Wetland (GW) birds recorded during surveys. Each point on the graph represents one or more sites: there were 16 revegetated sites in the lowlands and 25 in the uplands. In each region there were five pasture (P) sites and eight intact rainforest (F) sites to provide reference points for the revegetation sites. At each site a 0.3 ha area was surveyed six times across one year, each for 30 minutes (from reference 3). At around 20 years old, the average number of rainforest-dependent bird species in restored sites overlaps with the 'poorest' of the intact rainforest sites (Figure 1). However, this is also the case for some sites at only 10 years old, and calculations that incorporate the slow rate of progress in the second decade suggest that more than 150 years would be needed on average for restoration sites to reach the typical level of bird diversity seen in mature intact rainforest. Moreover, a comparison of the numbers of rainforest-dependent bird species in seven of the restoration sites previously surveyed in 2001 (at 6-17 years old) with survey data from these same sites in 2008 (at 13-24 years old), found that during this time there had been virtually no progress towards becoming more similar to the intact rainforest. Long term monitoring of birds in replanted sites at Peterson Creek found a similar lack of progress in the second decade after planting (see reference 4). Another feature of the bird communities in these restoration sites was the large amount of variation from one site to another (as shown in Figure 1) - most revegetated areas differed considerably from the 'average'. While some sites rapidly acquired many rainforest-dependent birds, others of similar age had much lower numbers. These latter sites are not on track towards ever achieving a completely rainforest-like bird community. Furthermore, regionally endemic rainforest bird species (those which occur only in the Wet Tropics and near vicinity) were only half as likely to occupy older revegetated sites as the non-endemic rainforest species. Among the seven endemic species recorded from this study's revegetation sites (Mountain Thornbill, Bridled Honeyeater, Macleay's Honeyeater, Bower's Shrike-thrush, Pied Monarch, Victoria's Riflebird, Grey-headed Robin), only one (the Mountain Thornbill) was more abundant in revegetation than in rainforest. A further four endemic species were recorded only in the rainforest reference sites and not seen in any revegetated site (Tooth-billed Bowerbird, Fernwren, Atherton Scrubwren, Chowchilla). Why do birds in revegetated sites recover at different rates? Clearly, revegetation can be successful in providing habitat for at least some rainforest birds, but the outcomes at any particular site are variable, uncertain and hard to predict. The next step was to delve deeper into the data from older restoration sites, to find out if anything could be gleaned about whether some of these sites had characteristics which made them more likely to be successful in developing rainforest bird communities, and in particular providing habitat for the Wet Tropics endemics. One likely contender would be a site's landscape context: for example, the rainforest birds might be slowest to colonise sites far from any intact source forest. This possibility was tested in a study which further scrutinised both bird communities and environmental characteristics of the 16 oldest (aged 10-24 years) plantings on the Tablelands (see reference 5). 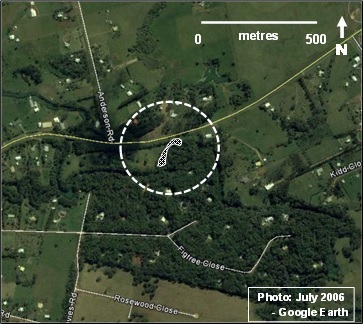 Environmental characteristics measured at each site included the percentage cover of rainforest, other forest, and non-forest visible in aerial photographs within different distances from the site's centre. Statistical analyses showed that rainforest-dependent bird species were most likely to occur in revegetation sites where nearby (within 200 m) remnant rainforest cover was highest; these were also the least isolated plantings (as illustrated in Figure 2 and Photo 1). Information was also compiled about the ecological characteristics of each bird species: its habitat preference, movement and edge-avoidance behaviours, and predicted sensitivity to climate change. Further statistical analyses revealed that both a bird species' degree of rainforest specialisation and its other behaviours could predict its likelihood of occurring in replanted rainforest. For example, the rainforest-dependent bird species that are least likely to use revegetated sites are those which typically avoid forest-clearing edges and lead sedentary lifestyles (spending virtually all their lives within a small local home range or territory). Conversely, the birds most likely to use replanted sites are mobile, edge-using rainforest species and forest generalists (found in both rainforest and eucalypt forest habitats). Figure 2. The number of rainforest-dependent bird species recorded in restored rainforest sites in relation to the amount of nearby remnant rainforest. 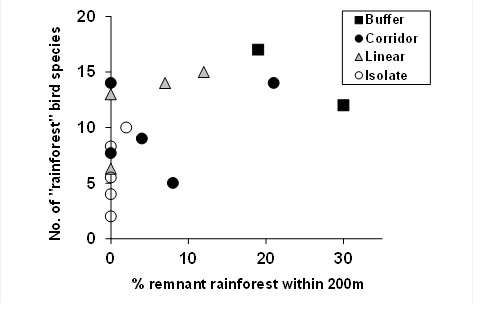 Different symbols are used for four categories of spatial configuration: buffer (a strip along the edge of a remnant rainforest patch), corridor (linking two such patches), linear (a strip with one end adjoining a remnant patch) and isolate (surrounded by cleared land) (from reference 5). All these findings together make logical sense - where there is a higher percentage of rainforest cover nearby, the availability of potential colonisers is increased, and sedentary specialists living in adjacent mature forest can extend their daily movements into the replanted areas while still retaining access to the unique features of the adjacent mature rainforest habitat. Table 1 illustrates the influence of revegetation age and amount of nearby rainforest on some common rainforest-dependent bird species. 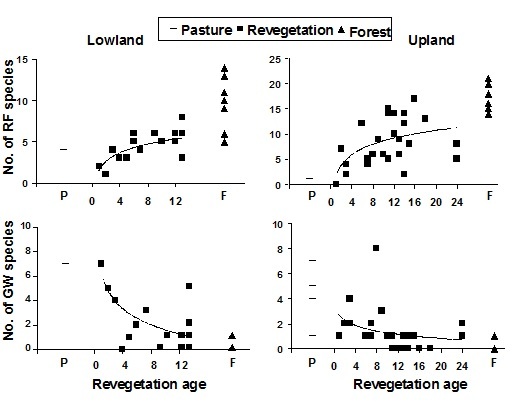 Examples of how the occurrence of rainforest-dependent bird species differs among three forms of revegetation (younger, aged 1-9 years; and older, aged 11-24 years, with less or more nearby rainforest), compared with intact rainforest habitat. Only the species found in more than 25% of the rainforest sites are shown; ordered according to their scientific classification. There was also some unexpected good news from this study. First, the size and shape of planted sites were not strong predictors of the number of rainforest bird species they contain, a welcome finding given that most restoration plantings are small, narrow and linear due to land and resource availability. Second, species considered to be at greatest risk of decline as a consequence of global climate change occupied restored habitat at similar rates to other species. This supports the idea that revegetating currently-cleared areas in upland climate 'refugia' can be useful in providing habitat for many climate-sensitive species. However most of the endemic species are an important exception: their habitat specialisation means that they avoid restoration plantings, and most of them are also climate-sensitive. It remains a challenge to address the sobering finding that the good (albeit partial) progress in colonisation of replanted sites by birds during the first decade after planting is followed by negligible progress during the second decade. Amanda Freeman has now begun re-surveying the older Peterson Creek revegetation sites to further investigate the extent of second-decade progress. Despite efforts to rapidly recreate rainforest-like conditions by replanting with diverse native species, the habitat quality of the restored rainforest sites will inevitably be insufficient to meet the needs of some specialised and endemic rainforest species for many decades. For example, the Grey-headed Robin is a sedentary Wet Tropics rainforest endemic which was found in 88% of intact rainforest sites and 50% of older revegetated sites if they had more nearby rainforest, but only 20% if they had little nearby rainforest. It often nests in vine tangles, which are scarce in revegetated sites, while plentiful in intact rainforest (photo 2). To find out how to assist such species will require carefully focused research into their habitat requirements. Perhaps there are manipulations that can be made in reforested sites that may reduce the time it takes for these specialised bird species to colonise(such as installing nest boxes, encouraging some patches of tangled vine to provide nest sites, or other novel interventions). Creative experimentation together with ongoing monitoring are needed to provide more and better insights. Finally, this research has improved the evidence base for effective conservation planning, which leads to the following guidelines. When the goal is to maximise habitat area for the most vulnerable species (low mobility, rainforest-dependent endemics), restoration plantings sited adjacent to substantial areas of old-growth habitat are most likely to be useful. Isolated plantings can have beneficial biodiversity outcomes by bringing a much greater variety of rainforest birds into cleared parts of the landscape which otherwise lack them, and some of these birds in turn will disperse the seeds of rainforest trees. However these plantings will have little benefit to bird species which are specialised, sedentary or endemic. Protecting all areas of remnant rainforest from further clearing remains crucial, because revegetation in the short to medium term provides only a partial habitat offset for forest clearing. Catterall CP, Kanowski J, Wardell-Johnson G, Proctor HC, Reis T, Harrison DA and Tucker NIJ 2004. Quantifying the biodiversity values of reforestation: perspectives, design issues and outcomes in Australian rainforest landscapes. In: Conservation of Australia's Forest Fauna. Second Edition. (ed. D Lunney). Royal Zoological Society of New South Wales, Sydney, pp 359-393. Catterall CP, Kanowski J and Wardell-Johnson GW 2008. Biodiversity and new forests: interacting processes, prospects and pitfalls of rainforest restoration. In: Living in a Dynamic Tropical Forest Landscape. (eds NE Stork and SM Turton). Blackwell, Carlton, pp. 510-525. Catterall CP, Freeman AND, Kanowski J and Freebody K 2012. 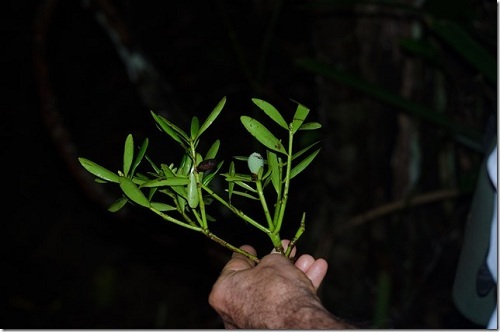 Can active restoration of tropical rainforest rescue biodiversity? A case with bird community indicators. Biological Conservation 146: 53-61. Freeman AND, Freeman AB and Burchill S 2009. Bird use of revegetation sites along a creek connecting rainforest remnants. Emu 109: 331-338. Freeman AND, Catterall CP and Freebody K 2015. Use of restored habitat by rainforest birds is limited by spatial context and species' functional traits but not by their predicted climate sensitivity. Biological Conservation 186: 107-114. Jansen A 2005. Avian use of restoration plantings along a creek linking rainforest patches on the Atherton Tablelands, north Queensland. Restoration Ecology 13: 275-283.